Purple Punch is an indica dominant hybrid made up of two stains known for their sedative qualities. The high is great for those suffering from insomnia, chronic stress, or pain. Her terpene profile is an exquisite combination of both grape candy and blueberry muffins. Purple Punch seeds are an indica dominant cannabis variety engineered by crossing two relaxing genetics, Larry OG and Grand Daddy Purps. The result obtained by this hybrid serves up some very resinous flowers, with a sugary, grape aroma and a very fruity candy flavour. Purple Punch is well known for its highly sedative qualities and the abundance of trichomes covering the buds make for stunning purple and white flowers. Growing weed from Purple Punch cannabis seeds is said to be of moderate difficulty. To grow indoors, try to mimic a northern California climate with balanced humidity and lots of light. Typical tent setups are fine with strong sources of light. Using 5-gallon buckets of organic soil and nutrients will provide you with a hearty medium. Flowering can be induced around 8 weeks. The plants growth is robust, vigorous and branchy, with a shrub structure whose main cola stands proud above the lower branches The Purple Plants grown from Purple Punch marijuana seeds react well to pruning. During the flowering phase, these plants form large, dense, colourful buds that glisten from a thick layer of resin coating. The Purple Punch scent is very powerful, rich in terpenes ranging from sweet grapes to blueberry muffins and candy. Indoors it can be harvested after 9 weeks flowering to give a medium to high yield, while outdoors it can be harvested in October. If you are in a region which will give them a handful of cooler nights in October, this will bring out the purple tinge valued by many users. 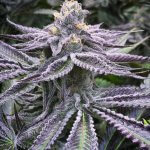 Buy Purple Punch seeds today and experience an excellent pain management strain with beautiful frosty purple flowers. Surprised at how well they grew, lots of dense, sticky buds. Only thing is I should have flowered them out longer to get bigger plants and more buds, but overall, I was very satisfied with the results.